The Carmel Group has strong relationships with venture capitalists and other funding entities globally. As an example, The Carmel Group’s Chairman and CSO, Jimmy Schaeffler, is an advisory board member of the well known telecom investment boutique, Near Earth LLC, located in New York City, New York. He has also participated, for example, in conferences conducted by Sierra Ventures. Be it Asian, European, South American, African or U.S. domestic, The Carmel Group has, through its almost twenty years of intense involvement in the global telecom scene, garnered the contacts and resources to accomplish just about any fundraising/investment services needed. Examples of past projects include helping to raise funds for Asian programming entities, and the same for European cable hardware suppliers, as well as for Midwest-based U.S. broadcasters. 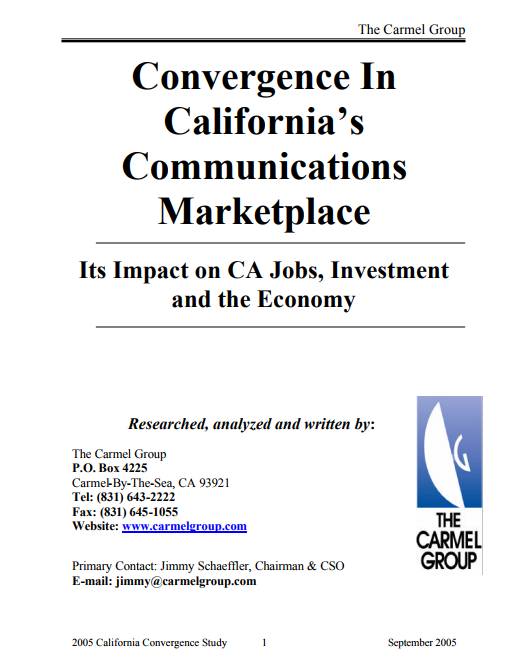 During the summer of 2005, The Carmel Group leveraged its extensive relationships with venture capitalists and investment analysts to complete a public study reviewing the economic impact of telecommunication communication convergence in California for AT&T. Another example is presentation at a recent high-level VC conference in Silicon Valley, involving a panel session and a one-on-one keynote interview by Jimmy Schaeffler with a top Disney executive, hosted by Sierra Ventures in 2009.